I’m snap happy. Maybe it's the designer in me. Maybe it's ‘cause I’m Asian. Walking a block can take hours ‘cause I’m nonstop capturing every little thang that excites me – from inspiring daily-diet design to warm-fuzzy-inducin’ moments to grubbin’ food to #whereeyebe. 21,789 photos on my phone and only one gap in time. No new pictures for two months. I lost the magic. Battlin’ the flu-turned-pneumonia kept me on lockdown, and when I finally came around? I was in a serious funk. Nothin’ caught my eye. But time moves forward – ready or not, I was on my way to Bulgaria. Friends warned that Bulgarians aren’t a friendly bunch (totally not true!). I was afraid that I wouldn't connect with locals. How would I score leads for trackin’ down vintage Bulgarian office supplies? Would I snap any photos? Would the STMT x Bulgaria sourcing trip be a total bust? On the drive to the apartment from the airport, I spied two small red and white dolls hangin’ from a branch. Bustin’ over a fence of an enclosed garden and suspended in the air – they glowed. They were magical. Rubberneckin’ while marking the location on my phone, I made a mental note to return for a photo. 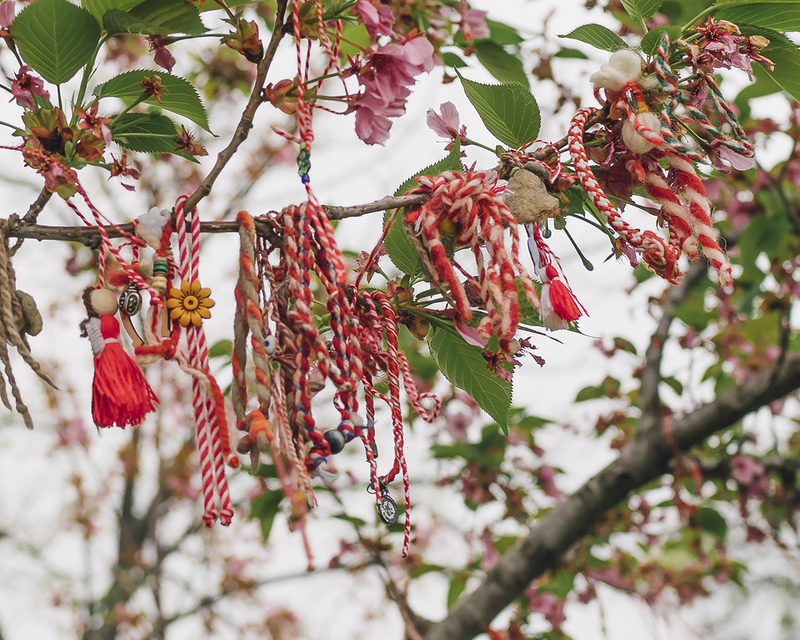 The Pizho and Penda dolls, Martenitsas, symbolize the arrival of Spring. They’re handmade from yarn (now sometimes purchased) and gifted to family and friends. 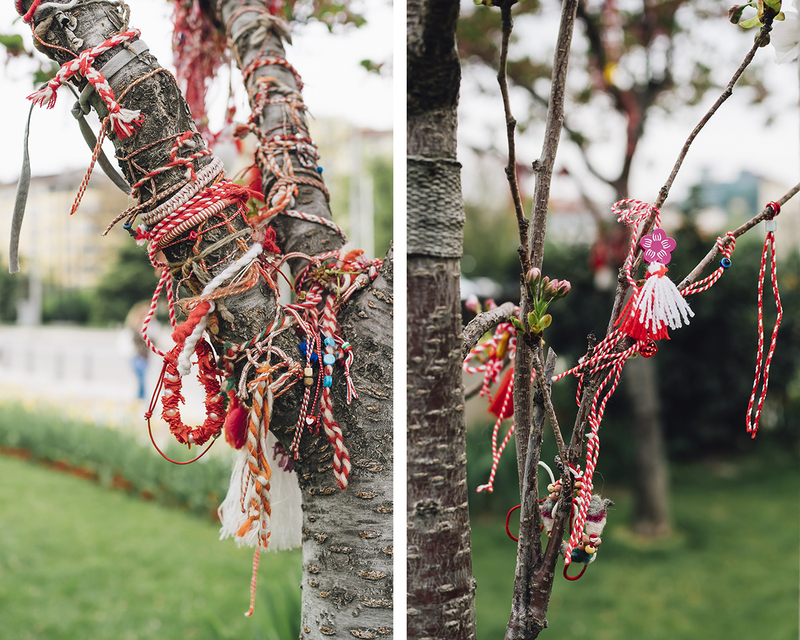 Bulgarians rock ‘em on Baba Marta Day until their first sighting of a stork or a blossoming tree. 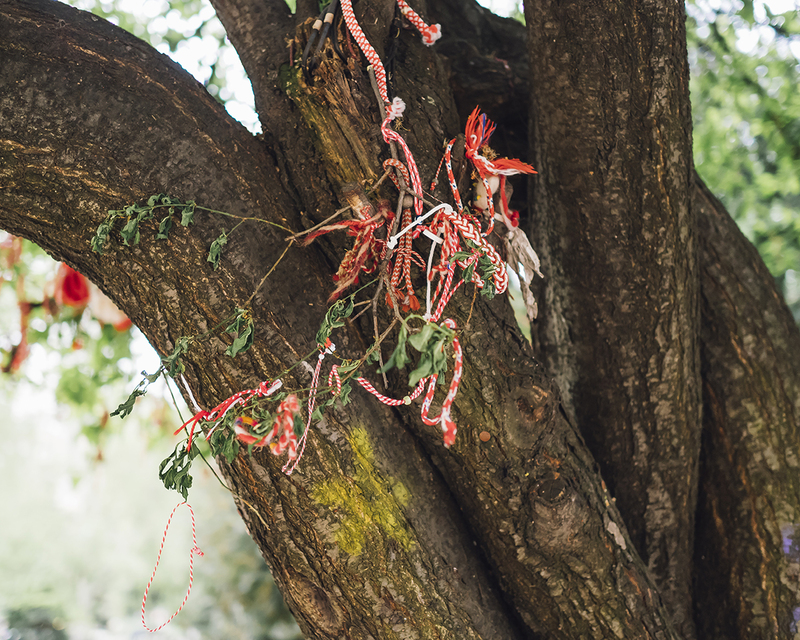 Then they promptly tie the Martenitsas to a tree branch. I never made it back to that corner, but I didn’t need to. Similar dolls and other forms were everywhere. 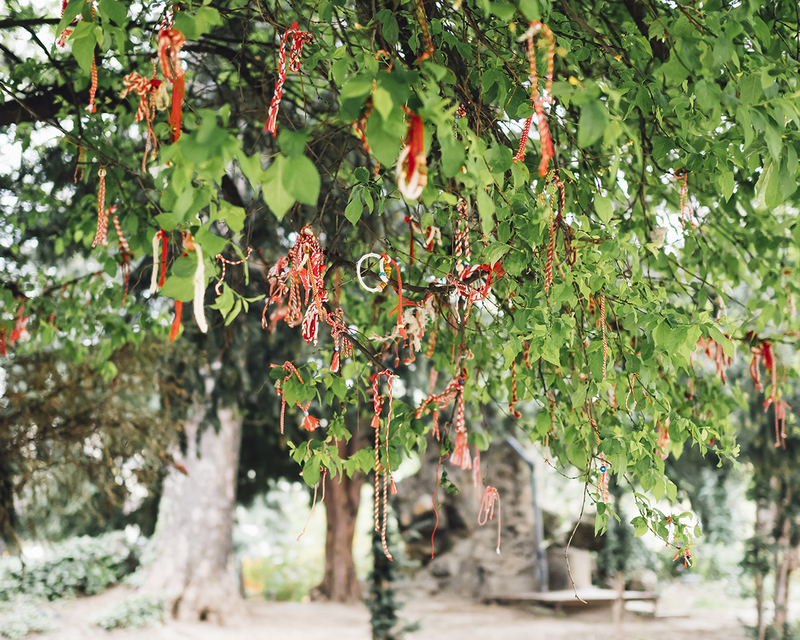 I walked by the same trees for several days before noticing hundreds of ‘em danglin’ from branches and tucked between limbs. I traveled the same paths without seeing the fallen ones on the ground. Phat and thick braids, simple and complex knots, metal beads and faux pearls, traditional and not (Pikachu! )… Martenitsas were the only thing I could see. And just like that… the magic was back! I spent my last day in Sofia putterin’ with one goal – snap photos. 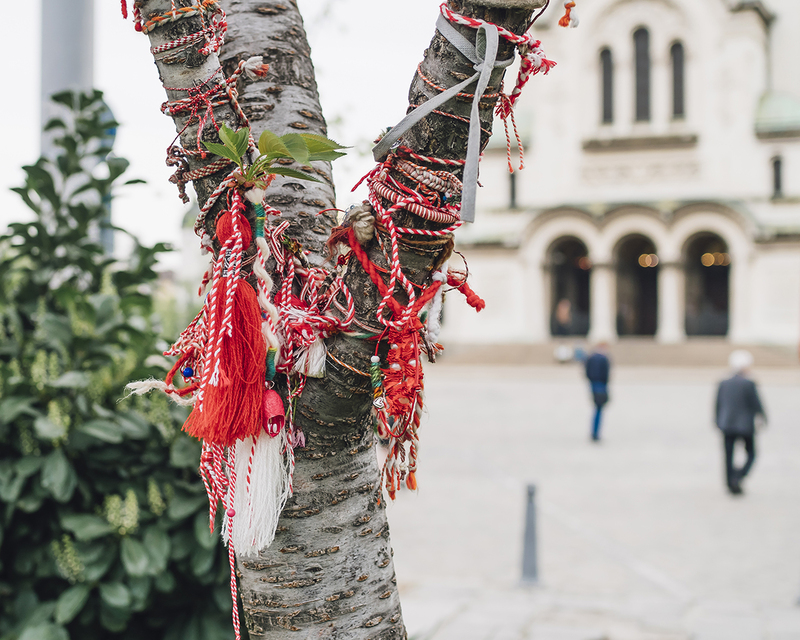 Walkin’ around town, spying tree after tree covered in Martenitsas made my heart full. All the love drippin’ in the air the old-school way was magic. Straight-up fairy tale livin’. Sometimes hidden, but not missing – beauty is everywhere. Bulgaria was a lesson in learning how to see again. I was reminded to blink away the crud, the buildup born out of the daily grind. Thick layers masking the shiny and exciting stacking up ‘cause I’m exhausted from rushing through life. The world felt dull. My mind foggy. Why was I letting the new give way to monotonous routines? Every day I’m traveling is a way of life. Stop and take photos. Wipe away the grime. Search for the magic in the every day. 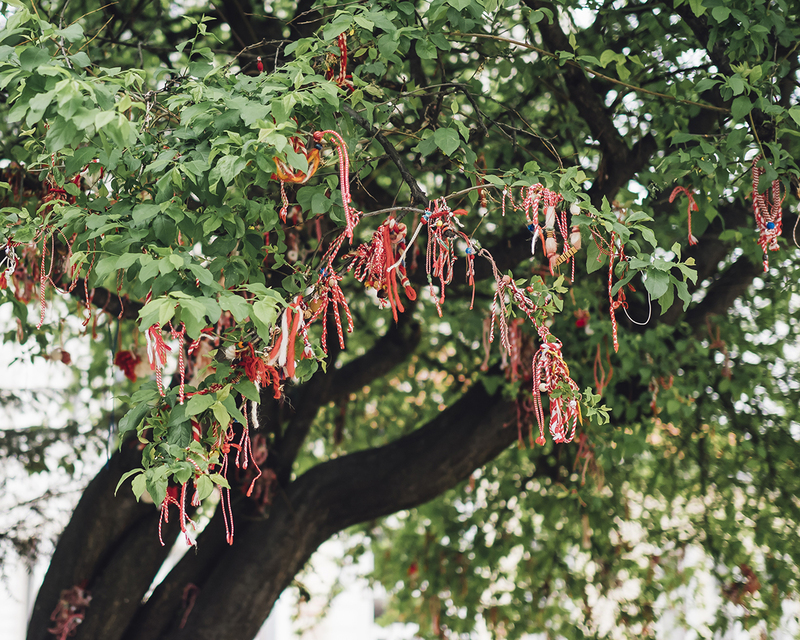 And sometimes we just need a little sign – Martenitsa magic.